Shopping for gifts doesn't have to lead to financial stress. 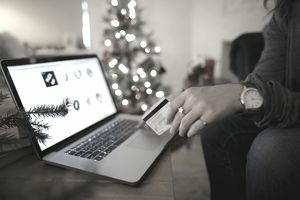 Learn how to budget your holiday gift spending, and make this the year that you finally come in on (or under) budget. Use this holiday spending worksheet to make your budget today. Determine what you can afford to spend. Look over your finances, and determine how much you can afford to spend on holiday-related purchases. Set this figure as your overall holiday spending limit. Set a spending limit for each area of holiday spending. Print out a copy of the Holiday Spending Worksheet. Then, run through the list of holiday expenses (gifts, decorations, holiday foods, etc.) in the first column, and set a budget for each area of spending. Track your spending throughout the season. Keep a running total of your purchases in the “Actual Spending” column of the worksheet. Then, use the “Amount Over or Under” field to track how closely you’re adhering to your budget. Tweak your budget to cover any instances of overspending. Don't panic if you overspend in one of the categories; just scale your spending back in another category to make up for it. Fill the worksheet out in pencil, to make updates easy. Use the holiday gift spending worksheet to help you set a spending limit for gifts. Use the "other" category to add more spending categories to the worksheet. Don’t be afraid to change your budget – a good budget is always evolving. Hang on to a copy of your budget after the holidays are over; it'll be helpful in planning next year's budget.